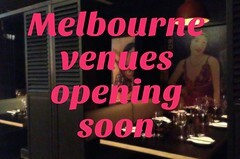 Taste of Melbourne has come and gone. 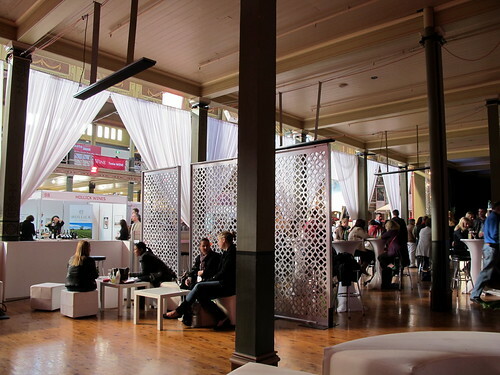 I'd never been in previous years but this time I attended Taste not once but twice: on opening night as a guest of HotHouse Media and then on Saturday because I was covering the event for SBS Food. 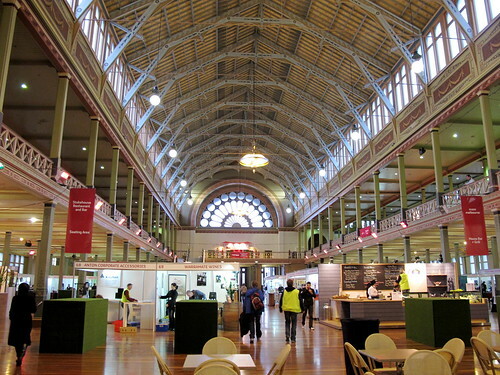 Although it's an opportunity to try dishes from several top Melbourne restaurants under the one domed roof, you have to remember going in that the dishes being served are unlikely to be truly representative of what you'd get in the restaurants themselves, given the lack of proper cooking facilities on site at the Exhibition Building for one thing. My friend Hannah's pet theory is that in a lot of cases, people think that eating at fine-dining restaurants is way too expensive, so they go to events like Taste instead because they seem more accessible – and sadly, end up spending just as much money for an inferior experience (and are then even less likely to actually go to any of the restaurants because they think it’s not worth it). Hmmm. 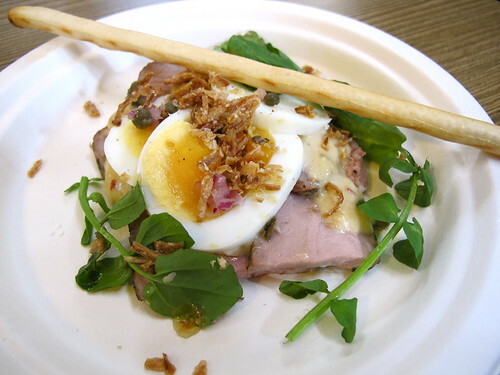 I think that provided you acknowledge that it's a commercial event, avoid the stalls where crowds are greedily gobbling up free samples, and you are a bit strategic about your menu choices and only go for dishes that suit the preparation facilities (dishes like braises are perfect), it's a fun way to try a range of great food. I'll confess I arrived as a first-timer with a degree of scepticism about the event, but was surprised by how much I enjoyed it. All of the dishes I purchased (or other people purchased and I tried) over the course of my two visits are detailed below. 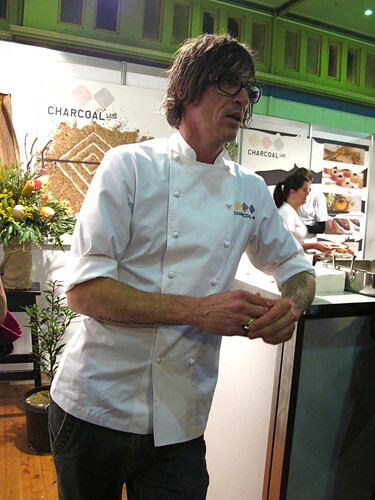 One of the chefs I was glad to meet at Taste was Damien Styles, head chef at Charcoal Lane. I've heard nothing but good things about Charcoal Lane, and was interested to hear about its nuanced use of native ingredients and the program it runs in conjunction with Mission Australia to provide hospitality training programs for Aboriginal and disadvantaged youth. Damien was a lovely bloke too. 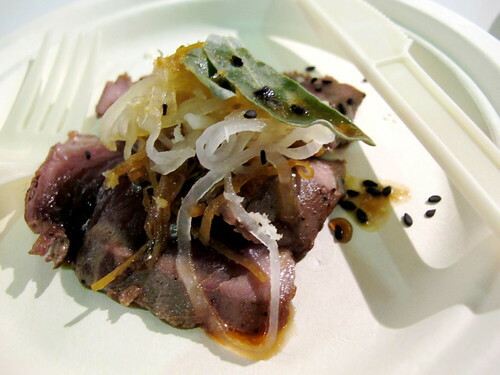 The Charcoal Lane dish that I tried was the wallaby tataki with ginger, soy and horseradish (10 crowns, the annoying fake currency used at Taste, equivalent to $10). The freshness of the ginger and horseradish cut through the richness of the wallaby beautifully. I want to get down to Charcoal Lane soon to try their menu properly. One of the Mezzo Bar & Grill dishes was organic slow braised pork cheek with white polenta, raisins and marsala sauce (a bargain at 8 crowns). 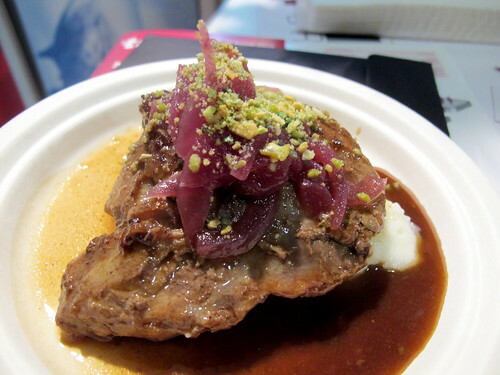 This was one of my favourite dishes - one poke of the plastic fork made the meat fall apart, and the tangy pickled relish was a great contrast to the marsala sauce. 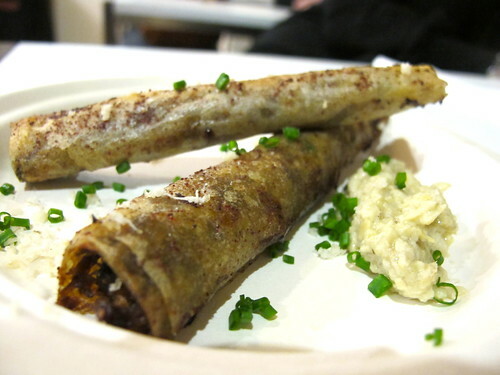 Stokehouse did wagyu beef cigars with artichoke and horseradish (12 crowns). These were very popular and while I concede that - in the words of one food blogger on Saturday - making a tasty dish out of deep fried meat and pastry isn't exactly rocket science, I thought they were very well executed. 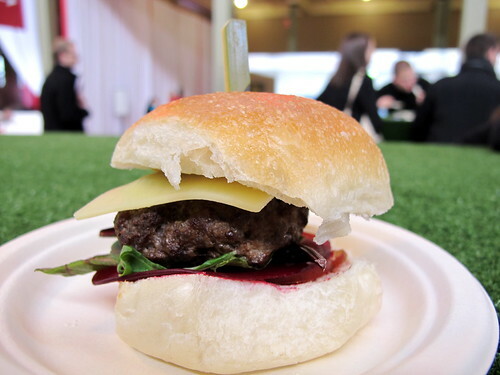 The longest queues BY FAR were for The-Palace-by-Luke-Mangan wagyu burger (apparently, the same thing happened with queues for the chip souvlaki The Press Club put on at Taste in 2008 - ah, the timeless allure of fast food!!). I purchased one of the mini burgers (10 crowns) and was disappointed by the cheap-tasting bread and dry patty, but Iron Chef Shellie spoke highly of one of the other dishes The Palace had on offer, the eye fillet with sauce Bordelaise. Forget burgers, give me a sausage roll instead. Particularly if it's a wild rabbit sausage roll with a dollop of tomato kassundi (10 crowns), as served up by The European. 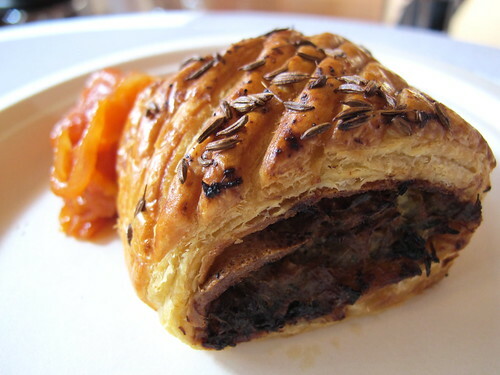 The fennel-accented filling encased in beautifully buttery pastry was a definite winner. And yes, I'm getting a little carried away with the macro on my new camera. It was naughty of me to order it, seeing as I've already had it several times before in their restaurant and I should have only been trying NEW stuff, but I couldn't go past getting a serve of Izakaya Den's spicy tuna tataki with wasabi and garlic mayo (12 crowns). BECAUSE IT IS SO DELICIOUS. 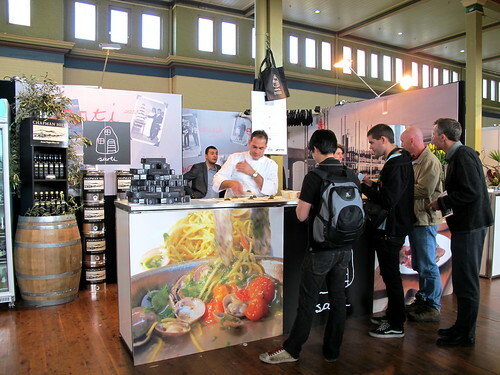 In addition to the 11 restaurants with stands at Taste for the full four days, this year the Powers That Be included a pop-up stand that hosted a different Melbourne restaurant on each day. This allowed smaller outfits like Embrasse and Raúl Moreno Yagüe's new Comida Bebe venture to be part of the big event. Each day the pop-up stand was kitted out differently: here's how it looked on Saturday for Izakaya Den. Interestingly, Izakaya Den's sweet corn kaki-age with green tea salt and Comida Bebe's patatas bravas (in the pop-up restaurant on Saturday and Friday respectively) were the ONLY savoury vegetarian dishes on offer from any of the 15 restaurants at Taste. Vegetarian visitors (like Johanna) were understandably pissed off about having so little savoury choice. Maybe the organisers for next year's event could try to entreat few more chefs to include a vegetarian dish on their menus? I also couldn't help but notice that, with the exception of Charcoal Lane and Longrain (and Izakaya Den on the Saturday), the cuisine was almost uniformly Euro-centric. 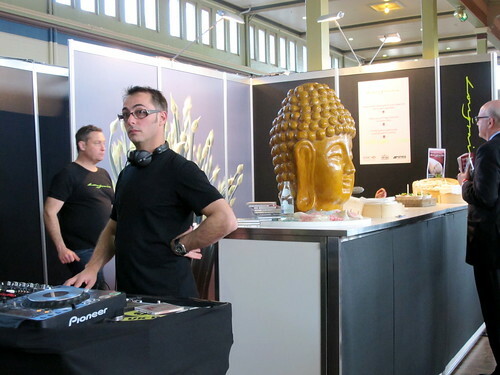 Has the line-up been more culinarily diverse in previous years? 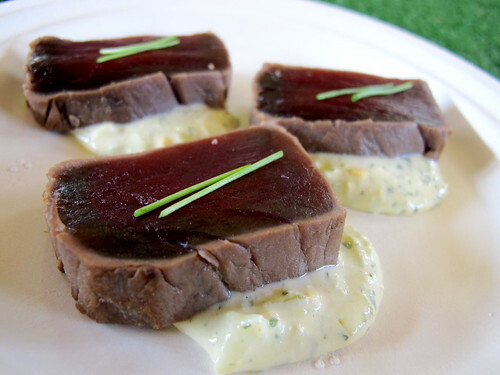 Nicky Riemer from Melbourne Wine Room did sliced poached veal loin with confit tuna caper mayonnaise (10 crowns) aka vitello tonnato, one of my favourite Italian dishes. The toppings were unorthodox but the veal was moist and the sauce was nicely creamy. I had a taste of the generously-portioned Longrain yellow curry of wagyu beef with cucumber relish (12 crowns). I wish it had had a bit more of a kick to it, but I suspect they toned down the spice for the festival. Longrain were definitely the cool kids on the block - not only did they have their own cocktail bar, they had their own DJ. Another crowdpleaser from Stokehouse was The Bombe (10 crowns), consisting of a heart of strawberry sorbet, a middle layer of white chocolate parfait and an outer layer of meringue that was being toasted on site by a blowtorch-brandishing chef. 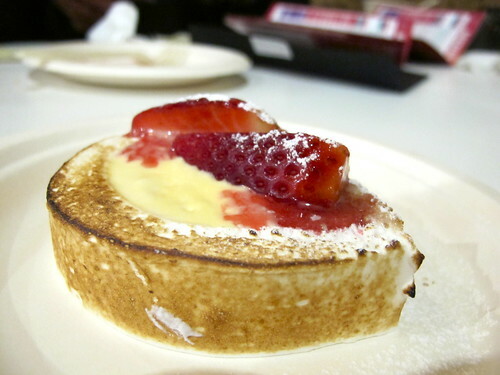 Topped with fresh strawberries (the Bombe, that is, not the chef). 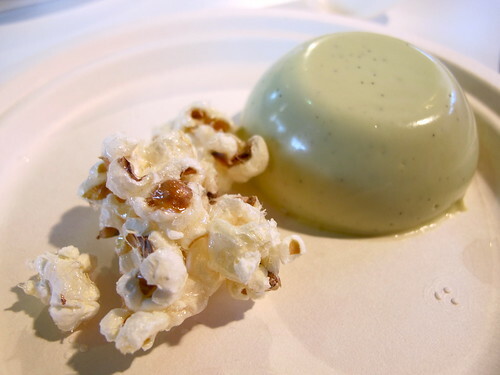 My favourite Sarti waiter was sadly nowhere to be seen by the time I visited for dessert, but I nevertheless loved their excellent pistachio panna cotta accompanied by a miniature asteroid of fused-together caramel salted popcorn (8 crowns). The last dish I tried was the exotic fruit vacherin with passionfruit curd (8 crowns) from maze. I loved it. The vacherin was more a sort of deconstructed pavlova, with a glob of cream in the centre, smaller dabs of passionfruit curd around it, pieces of fruit and small discs of meringue that had a curiously crystalline texture, an unexpected hint of salt and an acidity that I couldn't identify. I looked over and could see chef de cuisine Josh Emett behind the maze stand, so I went up to him, introduced myself and politely interrogated him about the dessert. 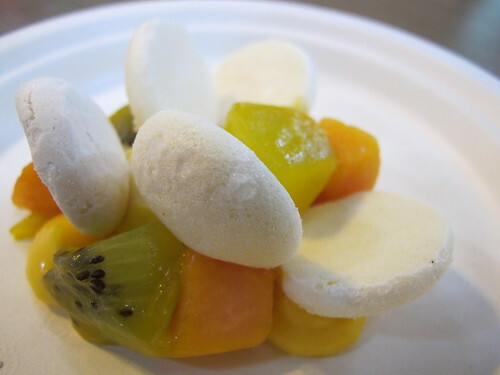 He revealed that the mystery acidity in the meringue was freeze dried passion fruit powder which he sources from a New Zealand company that goes by the (hilarious) Kiwi name Fresh As. I note from their website that their powders are also used in Attica's Terroir! 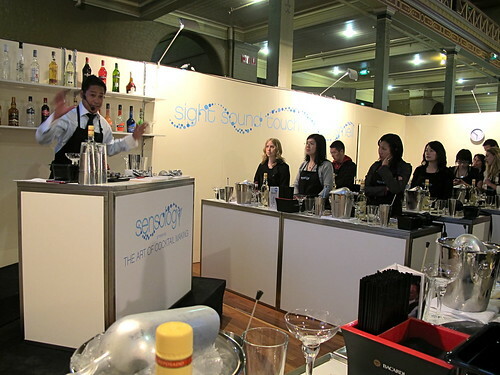 On opening night, in addition to being given a tour and a well-stocked goodies bag, the other invited bloggers and I did a cocktail making class in the well-stocked Sensology arena. 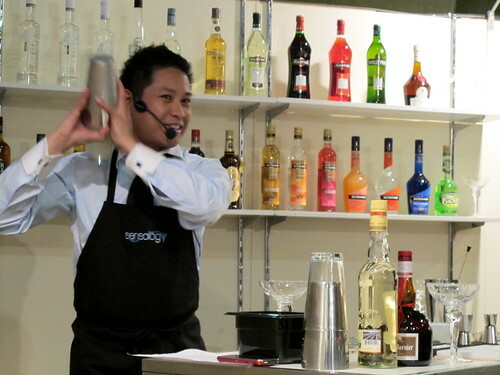 The jovial host demonstrated how to make a Grand Margarita, then we all copied him and made our own. Even with a laughably simple cocktail recipe that lists only four ingredients, you'll be glad to know that I still managed to completely screw it up. I am one lousy mixologist! 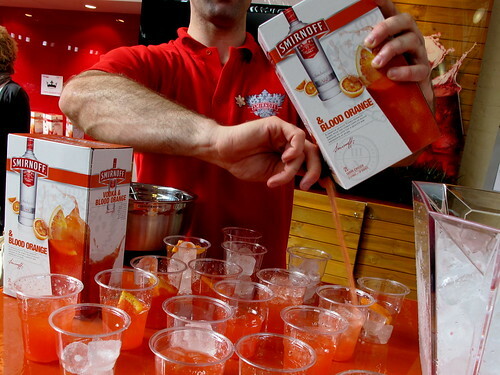 The prize for most ridiculous thing I saw at Taste goes to the new Smirnoff vodka with blood orange juice, which comes PREMIXED IN A GOON CASK. FFS. 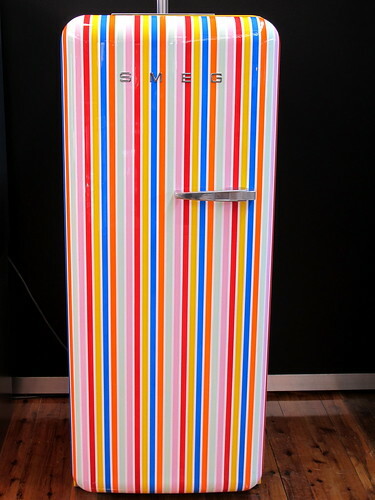 On the other hand, I think almost everyone who saw it (myself included) wanted to make sweet, sweet love to the stripy retro Smeg refrigerator. Thanks to HotHouse Media and SBS Food for providing me with press passes, drinks cards for the VIP Lounge and a bunch of crowns to try out the food. 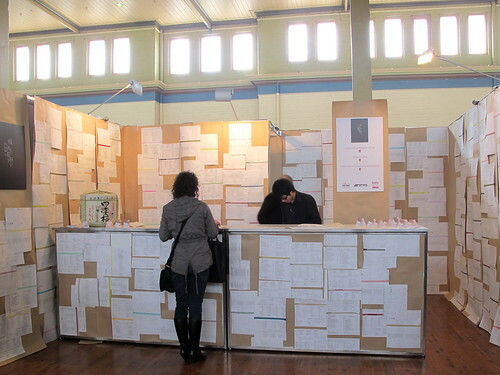 Did you visit Taste? Which dishes did you like/dislike? 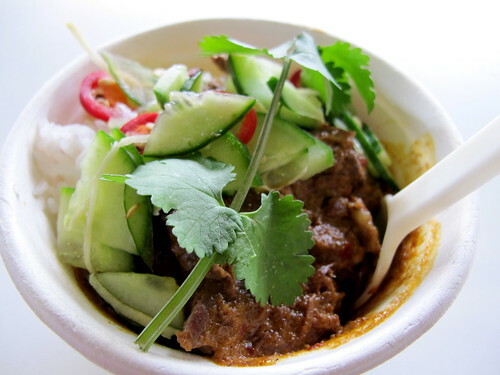 A link to the SBS Food page on Taste of Melbourne is here. Check it out! I went to taste for the first time this year too. Although i loved every bit of it, I was quite surprised how much money you go through while your there. I still have to put my blog up. Great post and photos! I want more of that wild rabbit sausage roll! How ridiculous is that cask of Smirnoff! I couldn't believe it when I saw it, I thought there were laws against those things? Ridiculous. Anyway, great post and love your photos! My outstanding dishes were the eye fillet with sauce bordelaise from The Palace - we went back for seconds, had the bombe on Friday and Sunday - was as incredibly heavenly both times, Maze salmon and the duck rillettes from Libertine & Le Traiteur together with the matched wine. My downers were definitely the burger from Palace and unfortunately the john dory from embrasse.. :( I think the piece of fish was too small and the ink over powered it, unlike the actual in house version. I really wish I had tried the Maze dessert now! The lack of veggo options was quite interesting. Saskia eats fish and veggies and there were still not that many options available. Must have been shocking for the genuine vegetarians! Also - 'Fresh As' was mentioned by Adriano at our macaron class. He used dehydrated blackberries in his French meringue animals. I was also highly amused by the name!! What, no wine? Or was it all more forgettable than the plonk at Pomeroy's? Great to finally see the quality photos that your blog totally deserves!! Well done mate! Looking forward to seeing more G11 posts soon!! I have a question for you Claire - Having experienced it this year, whould you pay for the experience next year? I haven't been able to muster the enthusiasm to go to this event yet and I'm not quite sure why I can't get excited about it. I knew it was on but opted for a night in with a nice cut of steak and a bottle of red instead. I do love the idea of a rabbit sausage roll though! Great pics! I had such food envy all weekend watching everyone putting up their posts. I wish I went twice because there was obviously so many dishes I missed out on. There's always next year I guess! I was really gutted about this years Taste, especially as last year I had a blast. 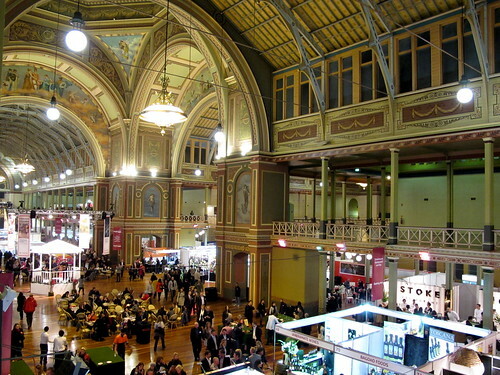 IMO there were way too many wine/ spirits stalls and not enough of everything else (food, especially). Such a shame, as my partner and I had been looking forward to it for a while. 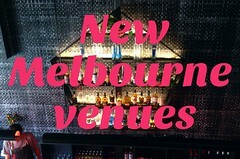 Maybe it should be re-named to Drinks of Melbourne? I was v. pissed off that I lined up for EVER for one of the Palace infamous wagyu burgers: for it to be STONE cold. And two of my dining companions were, too! For $10, I could have eaten sooo many other (better, hotter) things. Majorly disappointed. My highlight of the night was Sarti's pistachio panna cottas. ~ Something had to make me get over my horrible burger experience! I had the greatest time at this event last year, but found that it was so expensive that I didn't end up going back this year. A shame, but budgets are tight and I'd rather spend it on enjoying one night out. I agree that the Crown system is super annoying. Nothing worse than having 6 lousy crowns left at the end of the day! Great entry, really enjoyed it! I was surprised at how few food stalls there were, it seemed to be mostly wine, spirits, various cooking gadgets (from fridges to chopping contraptions), etc. I thought the restaurants' food was of a pretty high standard for the circumstances. I had the Embrasse pork belly (a crumbed, deep fried hunk of molten pork with a pea coulis and purple potatoes); the European duck tortellino (great shredded, braised duck filling, tasty jus, slightly tough pasta, perhaps it had dried out a little); and the prawn sausage and pistachio panna cotta from Sarti. In all I was happy enough with it, but I think if I'd paid to get in I would've found it way too expensive (someone gave me a VIP pass). At $30 entry plus $30-$40 for crowns you'd be better off going to a nice restaurant. Great post, Claire. I didn't end up going and now I'm regretting that! The fruit vacherin looks and sounds pretty amazing. Your photos look fantastic - macro FTW! Nice one Claire! Now I wish I could have interrogated Josh as well, but methinks he was only around for the opening night and not there on the weekend =P Lucky you!! Ah I had some of that vodka in the goon bag. Terrible I know! It was the first thing I saw so I went for it haha. As for cultural diversity - last year I don't recall there being that many varied cuisines either. Would be nice to get a better representation overall. I had my first experience of TOM this year too, after reading your post I'm glad I didn't bother lining up for "The Burger"! 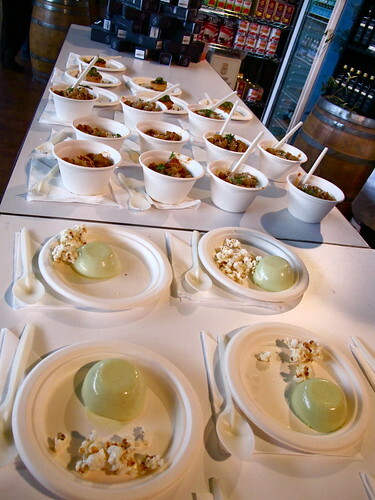 The panna cotta and popcorn was lovely too. Like others, I went last year and had a great time and planned to attend again. But after looking at the line-up of restaurants this year didn't bother.